Tech Transformation: Go for it Google! Of course Google wanted our evaluation straight after the event, while everything was still fresh in our minds and at the time I filled in my answer to this last question (which was about the Google 20% time), but today my response would be very different. 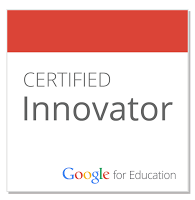 This is because since coming back to school we have set up a school domain to run Google Apps for Education with our students. So far we have set it up for our Grade 4 and Grade 5 students and are ready to start all these students using Google Docs when we return to school after the half-term holidays. We have also discussed using Blogger to have the students make ePortfolios and have already used Google Earth and Google Maps. I've also got plans to introduce Picasa and Picnik to our teachers when we're back at school after the holidays with the aim of using both these with the students later in the year. However in the past few weeks at school I've also used lots of other Web 2.0 tools and I would love it if these could also fall under the Google umbrella or if Google could develop similar apps that we could use as part of Google Apps for Education with a single log-in for our students. Suggestions would include a way of commenting using video or audio on photos similar to VoiceThread, animation such as DoInk and Xtranormal, timelines such as TimeToast or Xtimeline or apps such as HistoryPin to add old photos and stories to maps, presentation tools such as Prezi Meeting or SpicyNodes, and how about a comic maker along the lines of Bitstrips or interactive posters similar to Glogster? Currently we use all of these apps, some of which have educational versions, some of which are free and some of which we have subscriptions for. But for each of these the students have to remember their log in and password. Keeping track of these, and all the different subscriptions, is a bit of a nightmare. Is this perhaps a bit of an ambitious suggestion? The more I thought about it, the more I decided it wasn't. For example about 10 years ago I remember buying SketchUp which we had to download onto our computers. Now it is GoogleSketchUp and it is free. There's a similar story with YouTube, Blogger and Picasa which Google bought up 4-5 years ago. So if I had to come up with a big hairy audacious goal for Google now, and if money, time and resources were not an issue, this is what it would be: buy or develop more of these Web 2.0 tools and put them in Google Apps for Education so that students around the world can use them to publish their work and show their understanding. Go for it Google! Please. Great big hairy audacious goal! I will second that request, pretty please Google...schools need this!